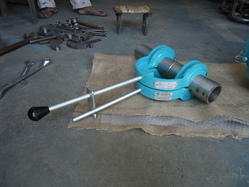 Size Range 6" to 60"
We are topmost manufacturer of Pipe Joint Clamp for Argon Welding. 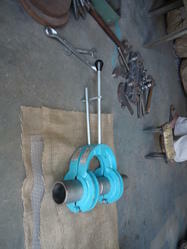 Pipe joint clamp for argon welding are cost effective method to quickly align a single size of pipe. The Pipe Joint Clamp for Argon welding is design to achieve rapid alignment of two pieces of pipe prior to welding. We are offering pipe joint clamp for argon welding which are made from premium quality raw material and precision built for accurate alignment and long field life. Precision built for accurate alignment and long field life. Available with stainless steel contact point. Fully stainless steel made clamps available on request. Size Range 2" to 6"
SHREE SHAKTI ENGINEERING is topmost manufacturer and supplier for Pipe Clamp Manual Small Size. Pipe clamp manual small size is suitable for small pipe size jointing. Our offered pipe clamp is manufacturer under surveillance of professional engineers. Each size pipe clamp small size fits one specific diameter. Pipe Clamp Manual Small Size is made from premium quality raw material and passed predetermined tested. Available size in 2” to 6”. The SHREE SHAKTI ENGINEERING Pipe Clamp Manual Small Size offers the simplest method of achieving quick, easy and precise fit ups. Pipe Clamp Manual Small Size is compact tack type clamp that is easy to use in close quarters. The Pipe Clamp Manual Small Sizes are available in 2” to 4”. The clamp aligns pipe to pipe to fitting and is ideal for alignment applications where reforming is not needed. To manufacture this machine, we use optimum quality material and component. This machine eliminates chances of manual error in welding. Made for years of reliable service. Easy to use in overhead works. A cast and machined high strength clamp. High clamping pressure created by the toggle latching mechanism. Low profile with large window access to the pipe.